The Trump election surprised many, including leaders and observers in the global robotics industry. Only a few would go on the record with speculation about whether the new president’s policies will benefit robotics. The effects of the Donald Trump election as U.S. president on Tuesday are already being felt by some robotics companies. During the campaign, Trump said relatively little about science and technology policy. However, his promises to restore jobs in certain industries such as manufacturing and mining, plus tensions with Silicon Valley, have led to worries among robotics leaders. There is no doubt that Trump’s victory surprised pollsters and political commentators. What has emerged is a sense of uncertainty within high tech and the international robotics industry that’s similar to — if not quite on the scale of — the so-called Brexit vote. Chris Anderson, CEO of drone firm 3D Robotics Inc., which has facilities in Mexico and the U.S., woke up to a plunging Mexican peso on Wednesday morning and had to take action to protect his Mexican employees’ wages. While it’s too early to judge exactly how the Trump election will affect the global robotics industry, the new president has said he’ll be renegotiating international trade agreements. The role of robotics in manufacturing will change based on the Trump administration’s policies around reshoring, immigration, and education. The fate of the recently released U.S. Robotics Roadmap is uncertain, as are efforts to control robotic weapons. Robotics Business Review reached out to 40 experts in industry, academia, startups, and the analyst community around the world to find out what they think the Trump election could mean for the robotics industry in the U.S. and elsewhere. Only seven people were willing and able to respond on the record. Well, besides the initial surprise of the results in contrast to poll predictions, much of the doubt emanates from the Trump organization itself, which did not respond to our request for comment. “Much about a Trump’s administration’s approach to science and technology — at least the policy details — will depend on the people he appoints to high-level positions, including his science and technology advisor in the White House, and to positions in several federal agencies,” explained Lane. On the other hand, President-elect Trump has been consistent and clear about two policy items: returning manufacturing jobs to the U.S. and his intention to renegotiate trade agreements like NAFTA. 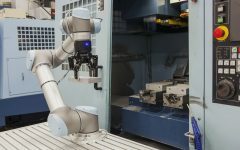 Given the deep penetration of robotics in 21st century manufacturing, what does this mean for robotics suppliers and users? Industrial automation can displace, support, and create jobs, but how does the Trump organization see this all playing out? Is it possible that a Trump administration, operating on a four-year deadline, might come to regard automation as a hindrance to the short-term objective of quickly creating more manufacturing jobs? One of Trump’s main points during the campaign revolved around bring manufacturing jobs to the U.S. to compete with foreign manufacturing markets, said Kyle Landry, practice lead for the Autonomous Systems 2.0 service at Lux Research Inc. in Boston. Terms such as “Industry 4.0” and “factory of the future” can be “thrown out as a buzzwords,” Landry added, but the technologies within them are very real, from the implementation of sensing, connectivity, and analytics across the supply chain to the integration of collaborative automation solutions. What about Trump’s promise to rip up existing trade agreements like NAFTA so they can be renegotiated? The U.S. is a huge country, but from a global perspective, it is “getting smaller and smaller in a world that is getting smaller and smaller,” said Marianne Andersen, CEO of RoboBusiness Europe. “Trump needs to think about this. It will be beneficial for all of us to work together. The U.S. can benefit from working with Europe for sure — and the other way around,” said Andersen, who expressed concern that the new administration may make it harder for European robotics companies to break into the U.S. market. Employment worries were a key part of Donald Trump’s appeal. The traditional manually intensive manufacturing jobs that left the country will “never come back, due to simple economics,” according to Alfonso Iniguez, founder of Arizona-based Swarm Technology LLC. Despite the usual “honeymoon” after the Trump election, the new president doesn’t have that much time, given his promise to bring manufacturing jobs back within four years. Europe is also working to return manufacturing jobs lost to China and other low-wage countries, but there’s a race on, Andersen said. Will Trump consult the robotics roadmap? The Obama administration released its Roadmap for Robotics last month, but the fate of that document is uncertain. The document presents a clear strategy to make the U.S. the top robotics manufacturer in the world, said Sharkey, but it’s unclear what a Trump administration will do with it. How will the Trump election affect the development and regulation of intelligent weapon systems? Sharkey, who is chair of the International Committee for Robot Arms Control, was cautiously optimistic. Industrial automation is expected to continue growing, regardless of politics. Beyond the Trump election uncertainty, however, the U.S. robotics industry is experiencing massive year-on-year growth. As Lux Research’s Landry pointed out, robotics companies received $395 million in investment in 2014 and more than $1.25 billion in 2015. Financial, Manufacturing, Public Safety, Robots & Law, Robot Law, Science & Technology, U.S.